Arsenal are in talks with PSG over the signing of Stanley Nsoki. The Gunners, who are known for having keen interest in talented youngsters, have shown interest and are already in talks for the player. According to reports from Get French Football News, Arsenal are very much interested in bringing the 19-year old defender to the English side and the youngster also want a move from PSG. Nsoki is said to have told the representatives of PSG that he isn’t happy of his place in the club as he is the fifth choice centre back of the club and he would prefer a move rather than signing a new deal with PSG. 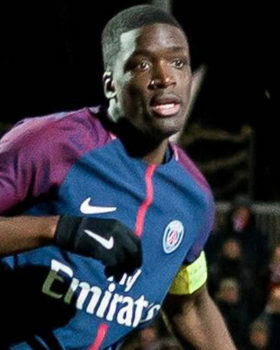 Although, Nsoki has one year left on his youth deal at PSG but the youngster hopes for a better football career as he tries to secure a transfer. Meanwhile, it is rumoured that a fellow Ligue 1 side and a top Serie A side have also shown interest in the player. However, new head of coach for Arsenal Unai Emery is said to know Nsoki from his time at PSG and it is speculated that this could have contributed in the interest Arsenal have for the player. This deal might actually be a good one for Nsoki as he isn’t that active in PSG and Arsenal have a record of building youngsters and it is hoped that he has a better career in Arsenal.